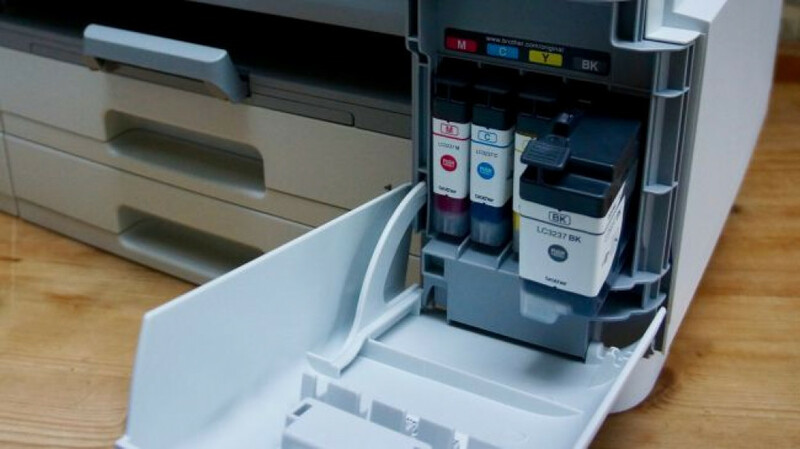 This well-specified MFP proves that inkjets have some advantages over laser printers in the small office in terms of cost-effectiveness and flexibility, but there are compromises in speed and consistency. If you assumed that laser printing is for the office and inkjets are only good for printing photos at home, think again. The X Series from Brother introduces five inkjet machines that are all aimed at the small to medium-sized business (SMB). 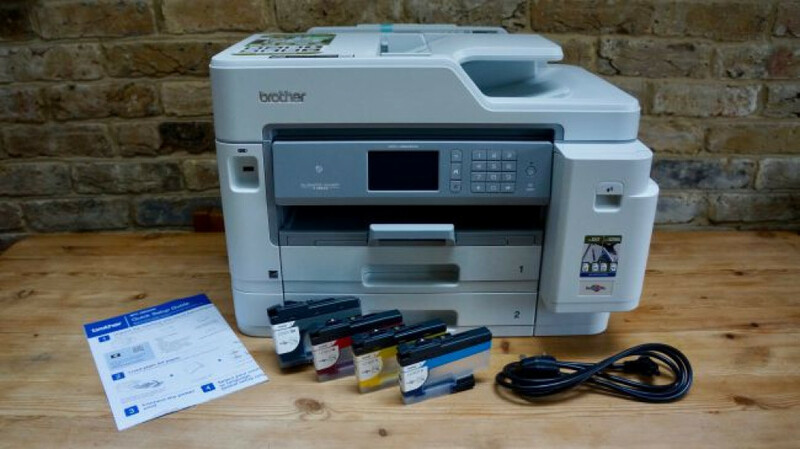 The Brother MFC-J5945DW is the more affordable of a trio of four-in-one multifunction devices and costs £419 (around $534, or AU$739) including VAT. Because inkjet technology takes up less room than laser, Brother has been able to cram more paper and ink capacity into this fairly compact desktop unit. 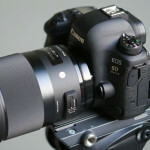 In fact, it can even print onto A3-sized paper, be that plain or glossy. It comes bundled with standard-sized ink cartridges, but with high-yield cartridges available and able to deliver 6,000 pages, this MFP’s running costs are actually lower than some laser printers. 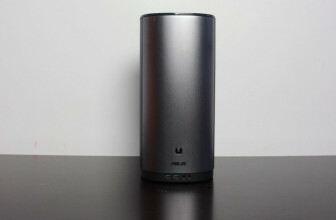 Like most of Brother’s office-oriented machines, the MFC-J5945DW looks like a sizable lump of gray plastic. The footprint is quite large, especially when you pull out the multipurpose paper tray at the rear and extend the front paper tray to accommodate A3 sheets. The lid of the scanner bed is also quite bulky because it includes a 50-sheet automatic document feeder (ADF). Even the compartment that holds the four ink cartridges bulges out from the front of the machine by a good few centimeters. Overall, the MFC-J5945DW takes up quite a lot of desk space, but it is still smaller than a laser-based device offering all of these features. The inkjet refill cartridges are larger than those found in your average photo printer and the two paper trays are deep enough to hold 500 sheets of paper between them. Perhaps more surprising is the fact that this printer can accommodate A3-sized paper fed either through the multi-purpose rear tray, or an extended front tray. We should point out at this point that the scanner is limited to A4 paper, and if you do need to scan A3, you should look at the more expensive MFC-J6945DW. The color display and control panel are a good size too. 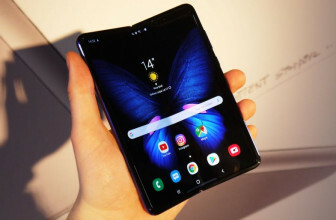 The 9.3cm touchscreen is reasonably responsive and is set in a tilting panel that makes it very easy to operate. There’s a convenient USB port in the front panel for plugging in a flash drive and another USB port inside the body of the printer. 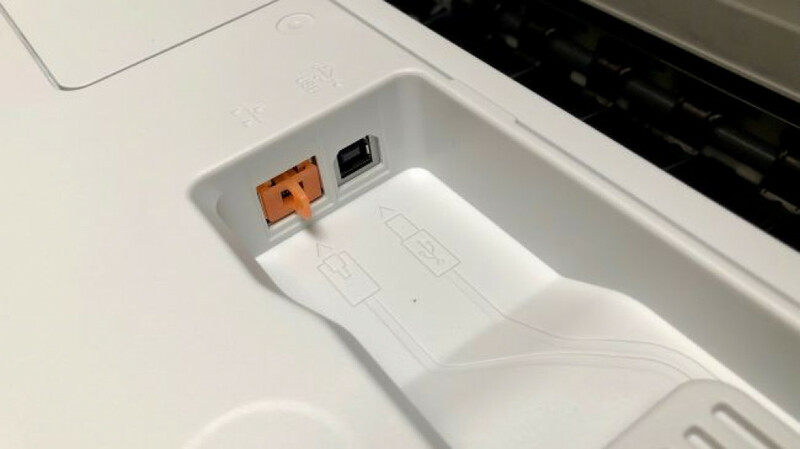 You have to lever open the whole top half of the printer to access this latter port and an Ethernet connection, but if you choose to use these, the plugs are less likely to be pulled out and the cables are neatly managed so that they trail out of the back. It’s a whole lot of plastic, but the MFC-J5945DW feels as though it is built to last, and the curved lines make some attempt to blend its bulk more into the background. 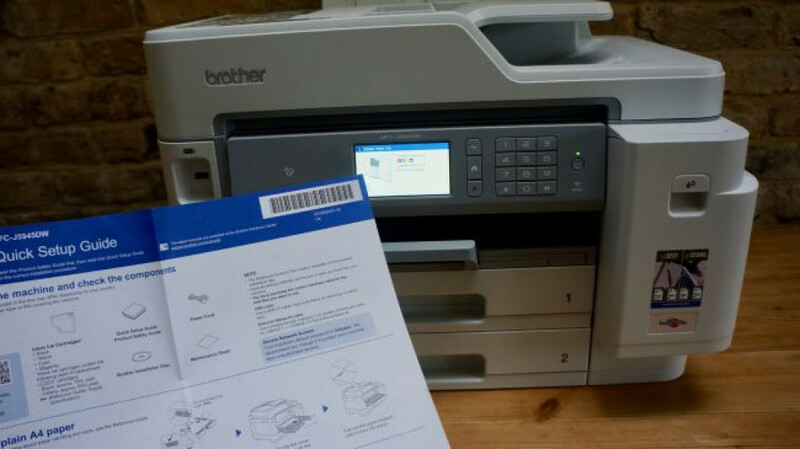 The Brother MFC-J5945DW is a four-in-one multifunction device which means it can print, scan, copy and fax, but that’s just the basics. 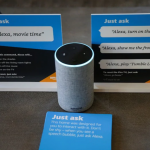 Both Wi-Fi and NFC connectivity are built in so you can print and scan remotely, or by pairing via your NFC-enabled smartphone. 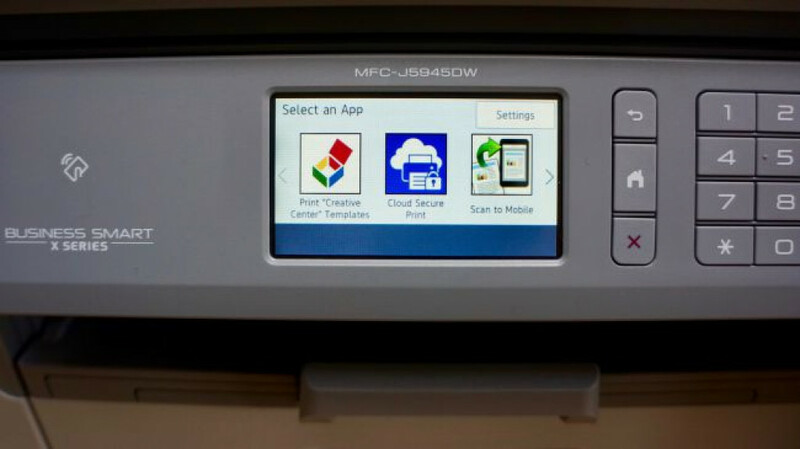 This MFP can print on both sides of the page and scan two-sided documents to a single sheet. There’s a 50-sheet ADF if you need to scan a stack of pages and the large 9.3cm display gives you easy touchscreen operation. There are two paper trays making for a combined 500-sheet capacity and another multipurpose paper tray at the rear for envelopes and letter-headed paper. And being an inkjet means it’s possible to load glossy photo paper as well. You can even load A3-sized photo paper and it’s this flexibility that gives this MFP a real advantage over its laser-equipped rivals. 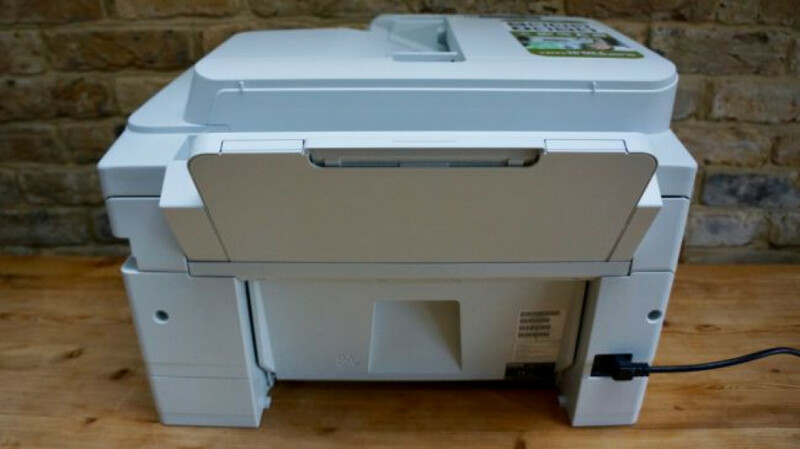 What it cannot do is duplex print on A3 paper, or scan A3-sized documents, but a built-in feature makes it very easy to blow up an A4 scan to A3 paper. The print speed is 22ppm (pages per minute) at full speed in mono, which is fast for an inkjet, but slower than your average laser printer. 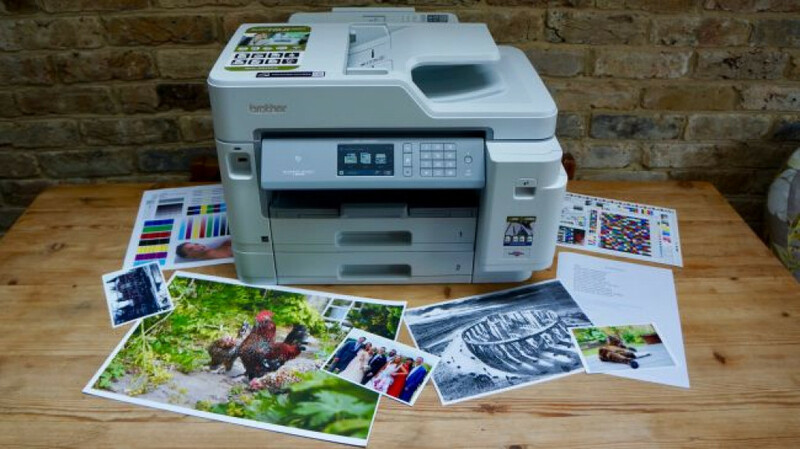 Its maximum print resolution is reassuringly high at 1,200 x 4,800 pixels and this MFP will scan at up to 600dpi. The other standout specification from the box and the brochure is the quoted print yield of 6,000 pages. This is a little misleading as it pertains only to the high-yield cartridges. The black cartridge you get in the box can manage up to 3,000 pages, while the supplied color cartridges will print 1,500 pages. Switch to the high-yield cartridges and the running cost of this machine is better than most other inkjet printers in this category. Weighing 21kg, this sizable MFP is really a two-person lift, but a small innovation in the packaging makes it possible for one person to heave it from the box. Brother has simply incorporated a carry handle in the plastic bag the device is wrapped in, but it makes all the difference when you are hauling the thing from the floor to desk. Loading the ink cartridges is also particularly easy as they’re quite large and simply push-click into place. One thing you will notice is how little ink is actually held in the cartridges that come bundled. You’ll want to replace these with the high-capacity cartridges when they run out. There’s a very clear Quick Setup Guide with the manual in the box, but you probably won’t need to refer to this as the large display takes you through the short setup procedure. Touchscreen control makes entering your Wi-Fi password and email address much easier than the old non-touchscreen system. 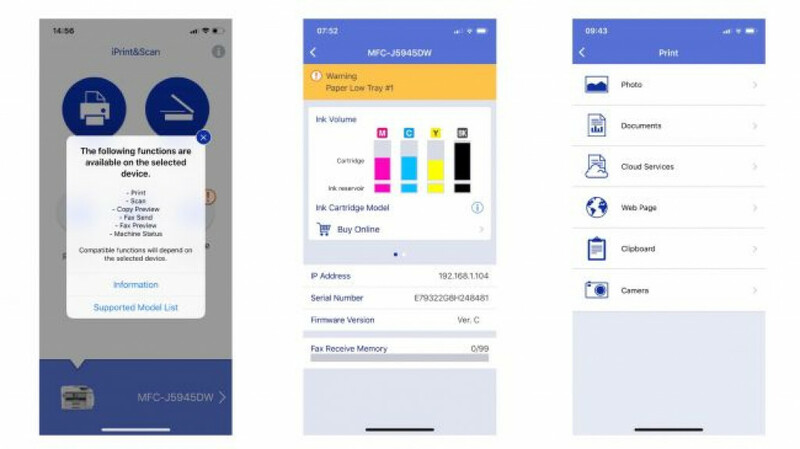 A QR code stuck to the printer (and reproduced in the Quick Setup Guide) takes your smartphone directly to the Brother iPrint&Scan companion app. 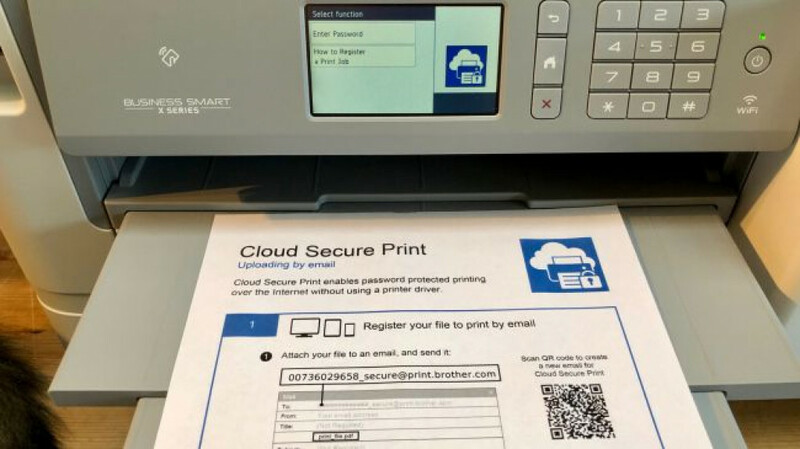 Download this onto your mobile device and the app will immediately find and join the printer, which means you can print, scan and monitor the printer’s status from your phone. The iOS/Android app is very well-designed making it easy to check your ink levels at a glance or print a document from a cloud service like Google Drive or Evernote. Within seconds we were able to sign into Dropbox from the app and run off duplex copies of a saved document without going near the printer. Loading paper is simply a case of pulling open the two drawers and filling them with A4 in a landscape orientation, or extending the drawer to accommodate A3 paper. Stiffer glossy photo paper is best loaded into the multipurpose tray at the rear where it is easier for the rollers to pull it past the printheads. We printed a few smudged copies before we realized this. It is also necessary to extend the paper-out tray unless you want your pages scrunched inside the machine, or fired onto the floor. 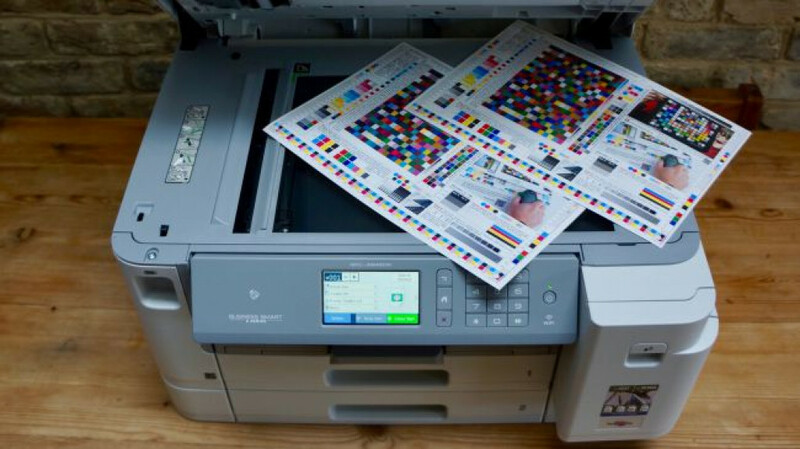 The Brother MFC-J5945DW prints quickly and quietly, for the most part. The motor that drags documents through the ADF is rather loud and the difference in speed between rapid mono printing and higher quality printing is considerable. 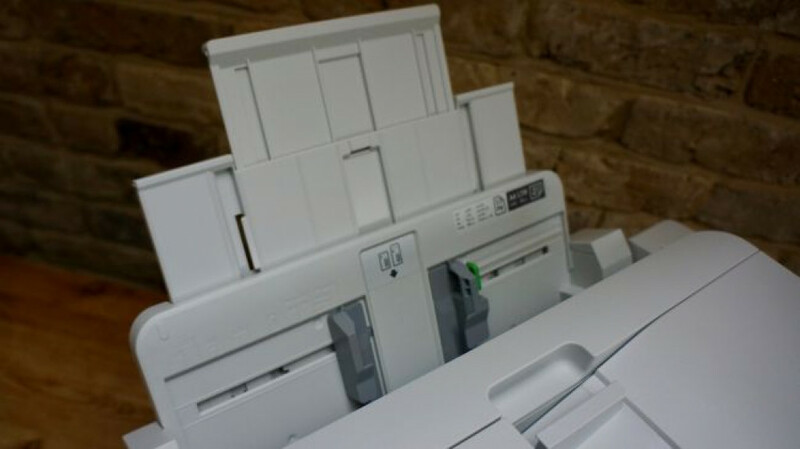 In normal mode you can churn out pages of plain text at a rate of 22ppm, which is fast for an inkjet. Switch to fine mode and you’ll get less than half that speed, and the difference in print quality is also marked. In fast mode some pages arrived with only half of the text legible. This appeared to be a one-off glitch and all subsequent documents were fine, if a little pale when compared to the same pages printed at the fine quality setting. 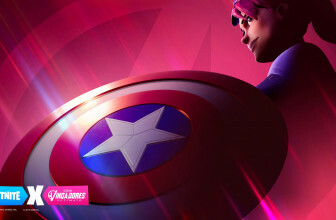 At this slower setting, every character emerged crisp and dark and consistent. So whereas laser printers are much better at churning out draft-quality documents, this inkjet managed to print superior fine-quality pages. Where this inkjet printer had an advantage was in printing color documents and photos, as inkjets tend to mix their inks more effectively to achieve realistic shading. In this case, color prints took longer to print than any laser, but looked more natural. Brother explained to us that printing photos on photo paper is not a priority feature for this business-oriented model, but more of a bonus for those occasions when you need to produce a glossy image and don’t want to use a separate printer. That said, the Brother MFC-J5945DW is still somewhat disappointing when it comes to photos printed on photo paper. Compared to other inkjets the colors look a little pale, with some softness at the edges where the colors are not so well contained. The color cartridges in this case are all pigment-based which means your printouts should keep their color well over time. The ability to print on A3 paper gives this MFP a significant advantage and there appears to be no compromise when printing at this size. The machine will accept glossy photo as well as plain A3 paper, which not all A3 printers are capable of. One other problem we noticed, however, was the appearance of horizontal lines on a photo print, which is a sure sign of a printhead becoming partially blocked. This was immediately solved by running the automatic printhead cleaning cycle, which uses more ink to flush out the blockage. It’s a minor inconvenience, but obviously wasting ink like this must affect your print yield, and it’s an issue that doesn’t affect laser printers. Given the comprehensive set of features included with this multi-talented multifunction printer, it looks like a cost-effective way of solving all the needs of your office in a single device. The initial cost seems reasonable given the decent build quality, and the running costs are low if you switch to Brother’s high-yield ink cartridges. The paper capacity is also surprisingly high, so it is well-suited to an office with heavy print needs. We encountered a couple of printing errors during the test, which highlights the fact that laser printers tend to be more consistent than inkjets as well as faster at churning out pages. Printing photographs is not the Brother MFC-J5945DW’s strongest suit, but the fact that it can handle glossy photo paper at all puts it ahead of any laser rival, while the ability to print on A3 paper, be that glossy or plain, is another significant feature that makes this machine something of an all-rounder. 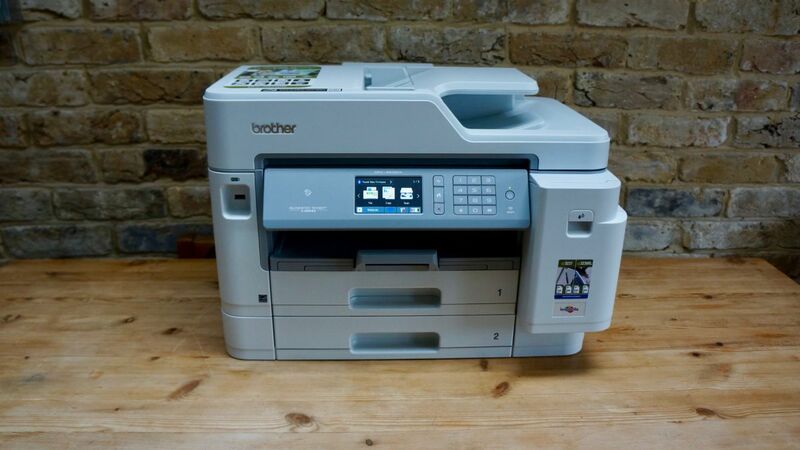 In short, the Brother MFC-J5945DW does a great many tasks reasonably well without excelling at any of them.